Sayan-Altai is the Motherland of Christ? The hypothesis put forward by Tuvan poet and writer Igor Irgit, stating that Sayan-Altai region is the motherland of Jesus Christ, has been issued as a book in Abakan. The author himself covered the expenses spent on the publication of the scandalous edition. 40 years ago the first congress of Tuvan artists took place in Kyzyl. It founded a new professional union - union of artists with 13 members. Among the initiators of its creation was Vladimir Diomin, Russin artist who came to Tuva in the 30-ties. He was the designer of the last issues of the postage stamps of the Tuvan People's Republic and the author of the Centre of Asia Monument. Today Tuvan Union of Artists comprises 58 artists, the majority of which are stone-carvers. Among them are 4 State Prize-winners of the Russian Federation. Tuvan shaman Nikolai Oorzhak has held in Moscow 2-days seminar on shamanism. The internet announcements attracted to the 'East' club 40 'pupils' ranging from an art-director of an advertizing firm to a driver. 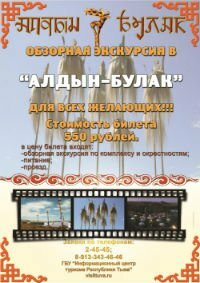 70 dollars' price for a 12-hours-long indulgement into the Tuvan culture, history, shamanic practices and Tuvan khoomei they considered a cheap one for such an interesting 'journey' to Tuva. 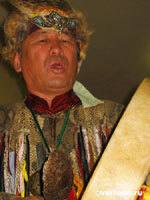 Oorzhak started as a throat-singer in the 'Tyva' ensemble in the late 80-ties later on devoting himself to shamanism. His seminars are now quite popular in Saint-Petersbourg, Kiev and Moscow. After Moscow he is heading for Ukraine. Tuvan Austria-based singer Sainkho Namchylak is planning to come to Russia in April. She will take part in the SKIF Festival devoted to legendary musician and composer Sergei Kuriokhin. She will present in the clubs of Saint-Petersbourg a program from her last album 'Who Stole the Sky'. The Tuvan Representative Office in Moscow, a big mansion in the very centre of the Russian capital; will be officially registered as an immobile property of Tuva on the territory of the megapolis. The place for it was given to the republic as a gift by Moscow mayor Yuri Luzhkov in the 90-ties. It was a kind of compensation for the taken away in 1944 Embassy of the Tuvan People's Republic. Italian singer and DJ Benny Benassi, who became world-famous mostly thanks to his successful single 'Satisfaction', will give a concert in Kyzyl April, 16. He will be the first foreign pop-star visiting Tuva. Each summer Tuva turns into Mekka for foreigners who are interested in Tuvan folk music but they are mostly jazz or rock musicians. Kyrgyz diaspora in Tuva numbering over 300 supports in its majority Revolution' in Bishkek. They say that the difference in incomes of different social layers in their motherland is drastic. The majotity of the polupation is poor. They have gone to Tuva in search for better life. The Supreme Court of the Russian Federation found the verdict of the Tuvan Court in regard of Eres Danzyn, ex-minister of culture adequate and true. In May last year Danzyn was caught red-handed in his office receiving a bribe of 10000 roubles (appr 350 dollars) from head of the Russian Cultural Centre Nadezhda Ponomareva. According to the official the money could have facilitated financing of the festival 'Singing culture of Old-Believers' which the Centre was planning to hold last summer. Today the 5th Volley-ball Presidential Cup among young sportsmen has started. Traditionally held during the spring school holidays it gathered in the capital of the republic 40 school and college teams. Each sportsmen and a coach of the winner-team will receive 500 dollars. Tuvan orchestra of traditional instruments qualified for the finals at the Krasnoyarsk regional stage of the All-Russian Musical Contest among the orchestras and ensembles of traditional instruments. Winners of the regional contests will perform in Saratov in September, 19-22. Tuvan orchestra was set up 2 years ago on the initiative of the leavers of the Department of Traditional Instruments at the Kyzyl Art School.